These 17 town houses were designed by 15 architects to certain rules of play fixed by the project's supervisor, Fons Verheijen. The different players interpreted these rules freely, resulting in a gratifyingly varied urban elevation or a vision of chaos, according to taste. The major attention-grabber is the house at number 9 with its convex facade plane of Delftware tiles and glazing and a rippling eaves line. In stark contrast are the high-tech house of steel, aluminium and glass (no.3) and the back-to-basics studio house with partly loamed walls cladding a timber frame at number 1. The twin houses (nos.35/37 and 25/27) were designed by one architect per pair as single units; two other lots (nos.31/33 and 15/17) have two houses per plot. 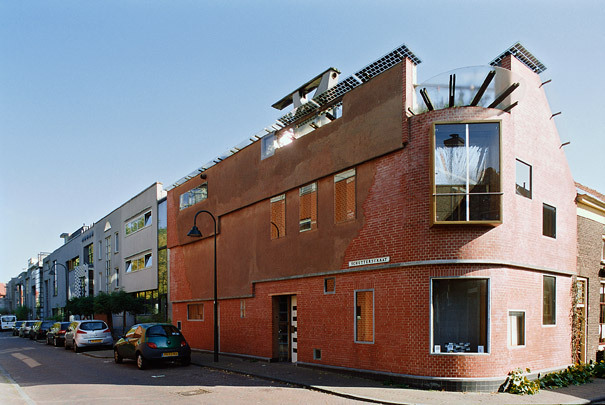 In Verheijen's own apartment block the base contains a restaurant and a cinema, with housing above accessed from a glazed buffer zone extending the full height and breadth of the block and seguing into the recast public gardens (Doelentuinen).